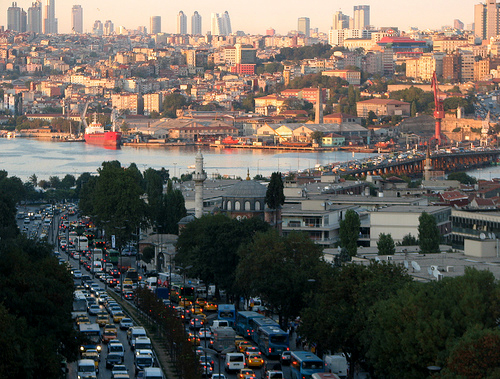 Istanbul has faced chronic traffic congestion for decades. Photo by adstream on flickr. Istanbul is creating 6 new bus rapid transit lines according to The New Anatolian, an English language Turkish newspaper. The director of Istanbul Electric Tram and Funicular Company (IETT), Mehmet Ozdemir, announced that the city will build 6 bus rapid transit (BRT) lines (including one already underway) and that construction should be finished by the end of 2008. Bus Rapid Transit (BRT) is a cost-effective rapid transit solution that acts like an above ground subway but with extra long articulated “accordion” buses instead of rail cars and physically separated lanes so that the buses don’t have to compete with traffic. Passengers pay at the station before they get on and the buses come frequently, just like in a subway. 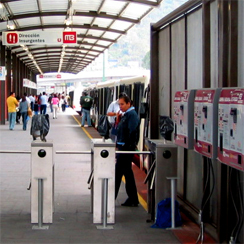 But unlike a subway, BRT is typically 1/10th of the cost, so cities can do much more with the money they have available and ideally make a bigger impact on congestion and pollution while managing the forces of motorization and urbanization. Take a look at some videos on BRT here and here. Done well, these 6 new lines could put a huge dent in the congestion that plagues Istanbul’s streets.